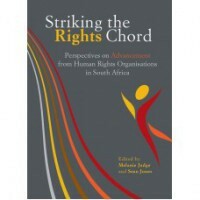 Striking the Rights Chord is an anthology of perspectives on the resourcing and sustainability of non-profit human rights organisations in contemporary South Africa. With contribution from leaders, activists and donors working in the sector, topics includethe funding context, governance and leadership, media and communications, strategic donor relations, and Advancement and fundraising practice. The dominant chord across the contributions is the compelling case for why the strength and survival of civil society organisations is essential to human rights, social justice, and democracy in this country.